March 22, 2019 (NEHALEM, OR). 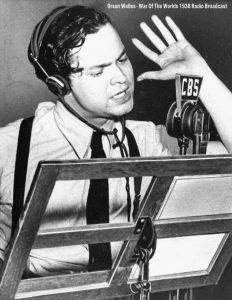 RIVERBEND PLAYERS in Nehalem will be hosting OPEN AUDITIONS for their Summer 2019 Reader’s Theater Production of The War of the Worlds: The 1938 Radio Script based on the novel by H.G. Wells by Howard E. Koch. This production will be directed by Sue Jelineo. Cold readings from the script. Group and solo readings. No preparation required but we encourage those auditioning to review the original 1936 Broadcast YouTube video online to get a flavor for the characters and reading style. All auditions will be held at the NCRD Performing Arts Center (Doyle Room). Please arrive on time at the open audition with theater resume (if available) and a list of any key dates you are not available to rehearse between mid-May-June 28. Beginners and theater novices are welcome and encouraged. If you know you’re planning to attend, please call or email the director at 503-475-3383 or email: sjelineo@nehalemtel.net or simply show up at the designated audition start time. Callbacks may or may not be required. If you are unable to attend either of the two scheduled OPEN CALL auditions dates, please contact the director to arrange a telephone interview. ABOUT THIS HISTORIC RADIO PLAY: Broadcast from New York’s Mercury Theatre in 1938, this infamous radio play, based on the novel by H. G. Wells, had many terrified listeners convinced that an actual alien invasion of Earth was taking place. Adapted by Howard E. Koch, co-writer of Casablanca, and directed and narrated by Orson Welles, this original script detailing the frightening tale of an extraterrestrial takeover is now available to bring to life onstage to thrill and chill audiences. CAST REQUIREMENTS: 5 males, 6 male or female (up to 4-22 actors possible) – some role genders may be altered based all audition turnout. All parts are available. This is a reader’s theater production which means all parts are read live on stage (no memorization is required). Cast will need to be available for all scheduled tech week and performance dates. The rehearsal schedule will be finalized based upon cast availability. First read-through tentatively scheduled for 4/10 with rehearsal schedule to follow. Anticipate 2 nights per week until tech week starting 6/24. Note: fewer rehearsals are required for reader’s theater productions. The performance dates for this production are July 5-6, 12-13 at 7PM and July 8, 14 at 2pm All performances take place at the North Country Recreation District (NCRD) Performing Arts Center, 36155 9th Street, Nehalem, OR 97131.